A day or two before making the cake, shape the wings and antennae so they have enough time to set and harden. To make the wings, roll out Renshaw White Petal Icing Paste on a surface dusted with icing sugar until about 2mm thick, then cut into your desired shape using a knife. For the antennae, start with two cocktail sticks. Wrap these in black ready-to-roll icing, roll until smooth, then add a little ball of black icing at one end of each stick. Make sure you leave about 2cm of the sticks free at the other end to attach to the finished cake. Store both wings and antennae in a cool, dry place to harden. Choose whatever cake flavour you fancy – we went for a simple Victoria sandwich recipe using a 5-egg mix – and bake in a large hemisphere pan at 160˚C/Gas 3 for 45-60 minutes, until a skewer inserted into the middle comes out clean. Once baked, leave in the tin until completely cool, then trim off any excess and turn out onto a rack. 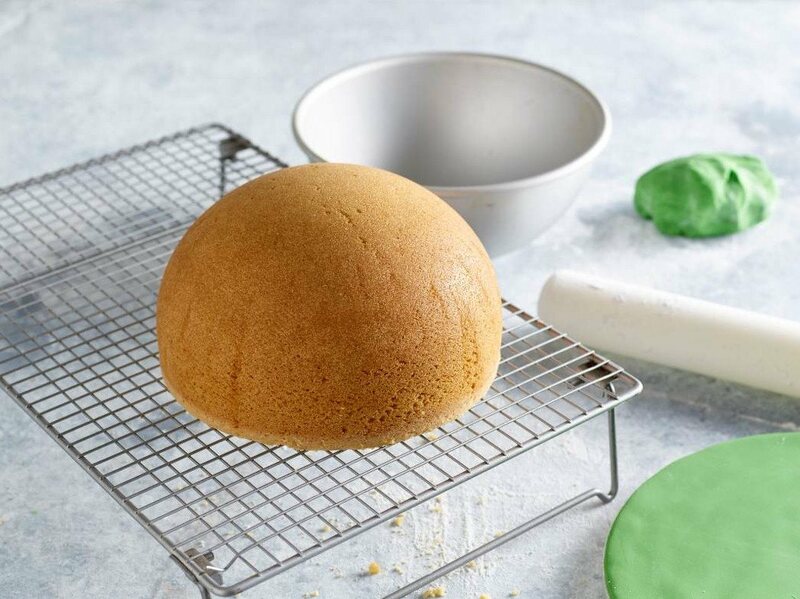 Meanwhile, cover a 12“ cake board with a layer of green ready-to-roll icing, then mix up enough buttercream to cover your cake and colour to make the stripes (we used 200g unsalted butter to 450g icing sugar, flavoured with 1 tsp vanilla extract). Cover your cake with a thin, smooth coat of buttercream and place both this and the covered cake board in the fridge for an hour to harden. Set aside the remaining buttercream. Roll out yellow ready-to-roll icing to a circle about 35cm Dia. Place over the cake and, using your hands, gently smooth from the top downwards before trimming any excess from the base. 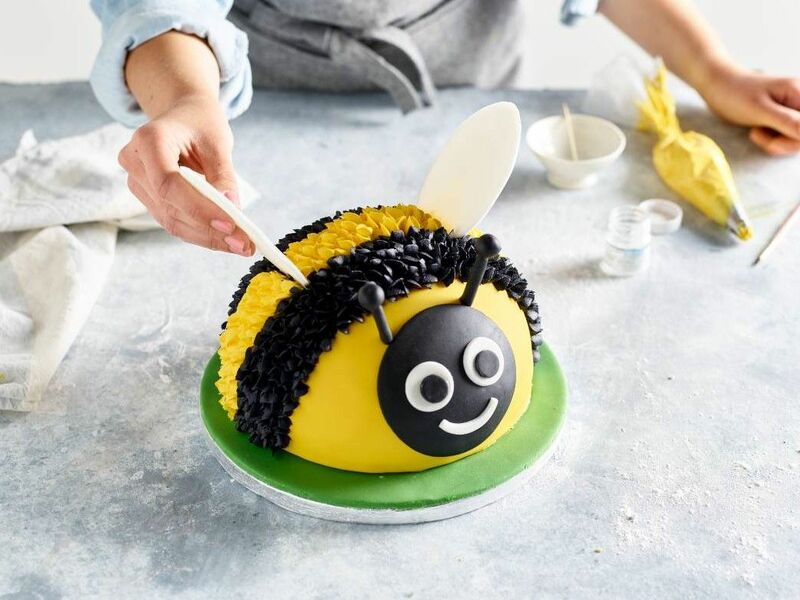 Spread a little buttercream onto the flat base and position your bee in the centre of the cake board. TIP: Lift the icing using a rolling pin or your hands; drape it over the top of the cake. Smooth the fondant using cake smoothers, pushing out any air bubbles and creases, starting on the top then working down the sides. Use a small knife to cut away the excess icing – don’t cut too close to the cake. 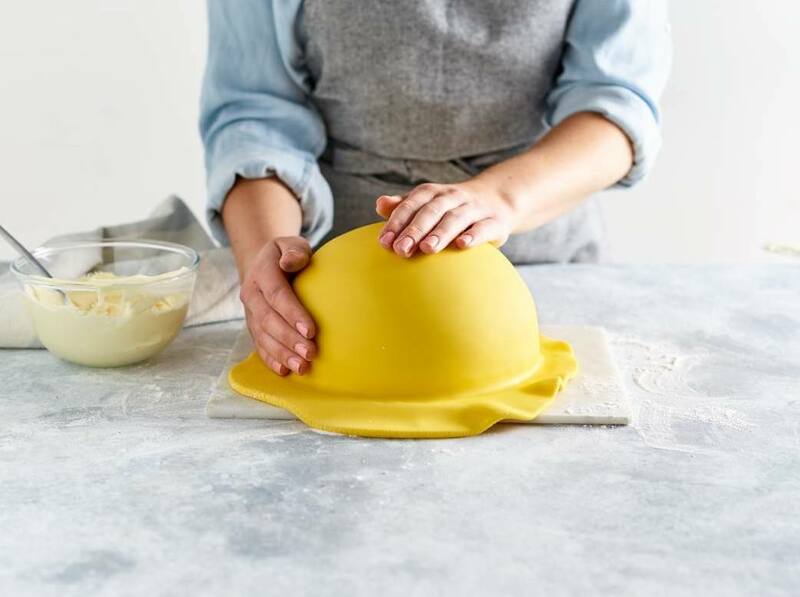 Divide the remaining buttercream into two bowls and colour one with black and one with yellow food colouring (we used the black and yellow bottles from the Wilton® Colour Right System). 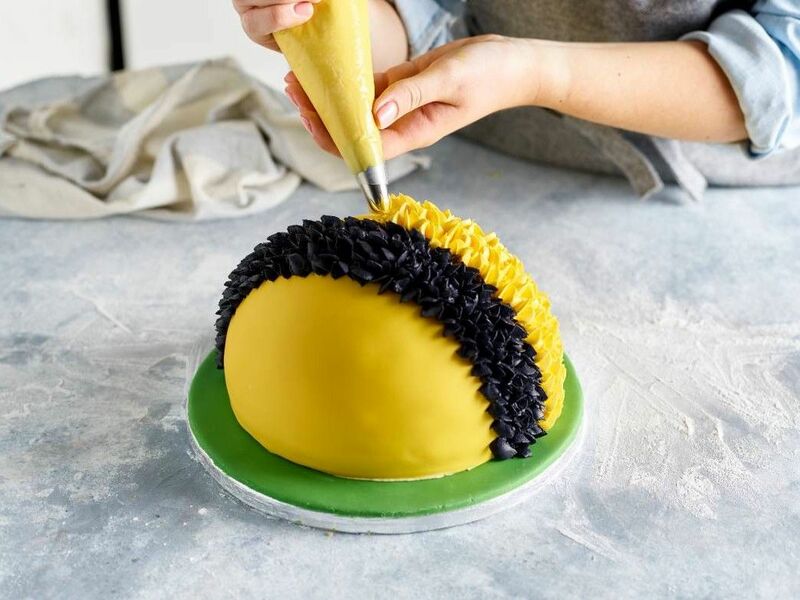 Using the Wilton® 2D Flower Nozzle, pipe alternate ‘fuzzy’ stripes of black and yellow buttercream onto the cake, starting with a stripe of black nearest the ‘face’ end, then one of yellow, and finishing with a stripe of black at the back. TIP: Perfect if you find regular piping bags too slippy or greasy, our disposable ‘Get a Grip’ Icing Bags have textured finish to help you get to grips with cake decorating. 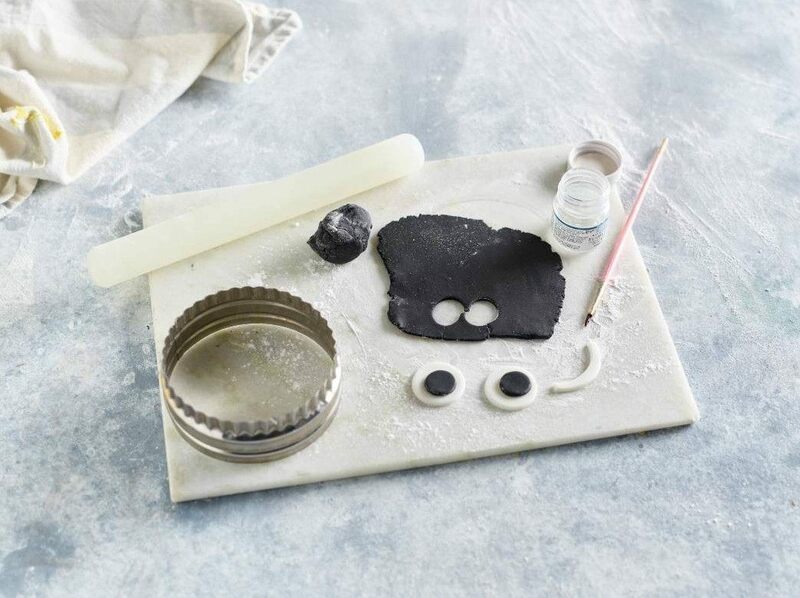 To make your bee’s face, roll out a circle of black ready-to-roll icing and cut out a circle about 8cm Dia. using a cookie cutter. Attach this to the front of your cake using a little Edible Glue. For the eyes, roll and cut out two smaller circles of white ready-to-roll icing and two slightly smaller ones of black icing (we used the bases of icing nozzles to get these perfectly round). Shape a mouth from the white icing using the edges of the cookie cutter. Stick the eyes together using glue, then attach the eyes and the mouth to the face with a little more glue. Slot the antennae in place above the face, then add the wings – these should have hardened enough to slot through the icing and into the cake. We finished off the base with a few little blades of grass (made using the grass icing nozzle in our Complete Decorating Set – it’s the one with a flat tip with lots of little holes in it) and icing daisies (using our Mini Fondant Icing Daisy Cutter). If your bee bake bee-haved and you want to use your hemisphere tin to create more cakey critters, you’ll find recipes on this blog to decorate a whole animal kingdom of flying, feathered and fantastical friends: ladybirds, robins, owls, penguins… or try doubling up your bake to make magical mystical unicorns. Whatever the occasion, you can bake a cake to match. Celebrate Easter with bunnies, summers of sport with footballs, the spookiest night of the year with Halloween pumpkins and Christmas with yummy chocolate Christmas puds… and if you want to bake a snowman, our tins can help you do that too!